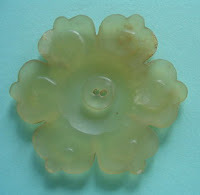 More nephrite jade flowers. On the left a beautifully scalloped mutton white piece, with doulble holes on the reverse, which means that it had served as a button. 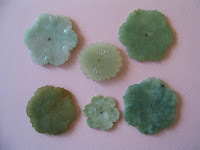 Next to it 6 smaller nephrite jade flowers in various shapes and designs. All from Ming-Qing periods.